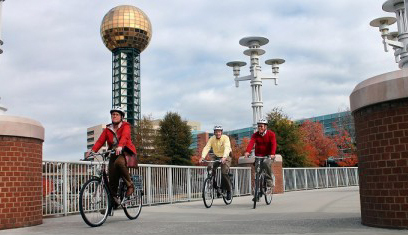 Ben Epperson, manager of the Healthy Kids, Healthy Communities Program, was fortunate enough to live within biking distance of his office at the Knox County Health Department (KCHD), in Knoxville, Tennessee. Not only did this make it simple for Ben to get to work, but it also meant he could ride to nearby meetings and appointments. In addition to his own thinking, Ben heard his coworkers were jealous of his bike travels. While he could hop on his bike to get to nearby appointments, or visit local lunch spots, many of his coworkers were faced with a quandary: too far to walk, too near to drive. Having no other options, KCHD employees had to use department vehicles or their own cars to go short distances. These concerns led Ben to seek assistance in how to safely implement a department bikeshare program. How could they ensure employees were ready to ride when they checked out a bike? Would a wrecked bike become an insurance nightmare? Did everything need to be documented, or could some things be left up to common sense? ChangeLab Solutions provided Ben with strategies for creating a safe, effective program. In the end, all participants were required to sign a user agreement/waiver, and take a one-hour bike skills and maintenance course. Everyone is required to wear a helmet and check bikes in and out. Of the department’s 300 employees, about 10 percent have already taken advantage of the program since its launch in 2012. At ChangeLab Solutions, we’re glad to have been able to help the Knox County Health Department get their bike share program rolling. To learn more about policies that can help get people biking around town, check out some relevant resources on our site: Getting the Wheels Rolling: A Guide to Using Policy to Create Bicycle Friendly Communities for decision-makers, government officials, community groups, and others interested in making all types of communities more bicycle friendly; Our infographic, Let’s Ride!, and our overview of America’s rich history on two wheels, Bicycling: An American Tradition.